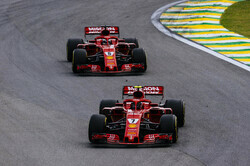 Maurizio Arrivabene: "Unfortunately, even though Kimi finished on the podium today, we were unable to reach our goal, which was to keep the battle going for the Constructors' title. Right from the formation lap, we became aware of a problem with a sensor on Seb's car. This meant that, for the whole race, he had to run different settings to those we would have normally used and that made the car difficult to drive. Congratulations to Mercedes on taking the teams' title." Kimi Raikkonen: "It was a nice exciting race. We had good battles throughout and the car was working well during the whole race. The speed was there and we had no particular issues. The first set of tires was very good at the start and I was really happy, but then I destroyed them a little bit trying to pass the Mercedes. Once we changed the tires the car was absolutely fine; we kind of knew that once we pitted we could have gone past them. After that the behaviour of the car was still very good, but at that point we were a bit too late, as it had taken too long for us to get there. As for the strategy, we did what we thought was the best for us. We can always debate many things, but today we made the best of it. Obviously it is not the greatest of results, but I don't think we could have got more; we did not make any mistakes and fought hard. As for the Constructors' Championship we knew that it would have been difficult; we did our best, but unfortunately it was not enough. The best team won this year, that's how it goes." Sebastian Vettel: "Obviously, this was not an easy race and I am not happy with sixth place. I tried to do my best, but the car was difficult to drive and I even struggled to drive on the straights. However, I am happy that Kimi got to the podium, because it is a good result for us, even if we didn't win the Constructors' Championship. Honestly, I don't think it was an advantage for us to start on Soft tyres, because the Supersofts lasted longer than expected, but that's how it was. The first part of my start was going well, but then the second was not that good, as I had nowhere to go with Lewis in front of me. I think we just didn't have enough grip in the second part of the "esses", Lewis and Valtteri worked together and I had no chance. Also, Lewis was a little bit quicker on the brakes to give Valtteri the outside line and then in lap 2 or 3 Max passed us as he was faster. There's not much to say as this year Mercedes has been stronger than us and we can only congratulate them." Check out our Sunday gallery from Interlagos, here. 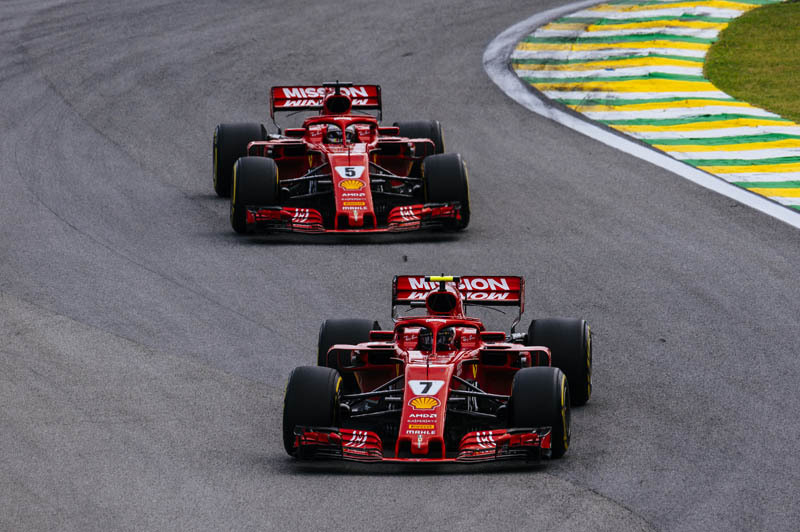 "Well done to kimi for getting on podium make a change from vettel he s never happy if things do not go his way quite surprised when he let kimi pass him"